Thank you for responding the vote in the previous article on 3 Efficiency Best Practices. In this article, we explore Word Styles in greater detail. Read this even if you are using Word Styles. Picture created using Fresh Paint on Surface Pro with finger painting. Problem: We spend too much time on formatting and too little on the core content. This how the default styles look. If you want to change the appearance to match your corporate branding guidelines, Right Click on each style, Choose Modify and change the look and feel. Customized styles affect only the current document by default. If you want all further documents to have the customized styles, choose the following option in the Modify dialog. Choose Page Layout tab (2007,2010) or Design tab (2013) and open the Themes dropdown. Just move the mouse cursor over each theme and see how the document reformats instantly with different color and font combinations. If you find some combination which resembles your brand colors, it is the easiest way of customizing document look and feel for corporate branding. Remember to use the same theme in Excel and PowerPoint as well. What are the benefits of using Word Styles? 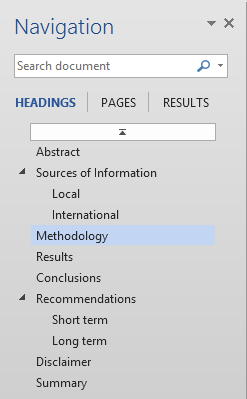 The main benefit is that Word knows what are the main and sub-topics in your document. Word uses this information intelligently to provide you with many useful features. Choose View tab – Navigation Pane. Now a Separate window opens on the left side and shows you the document hierarchy. This never gets printed. This is your on-screen navigator. Just click on the item to navigate to that area. No more scrolling and searching. Reorganize the document (and your thoughts) by just using drag-drop. Right click on any heading and you get many useful options. Explore and find out. The Show Heading levels option is very useful for reading complex documents. Just show level 1 first and then drill down into the desired area quickly. 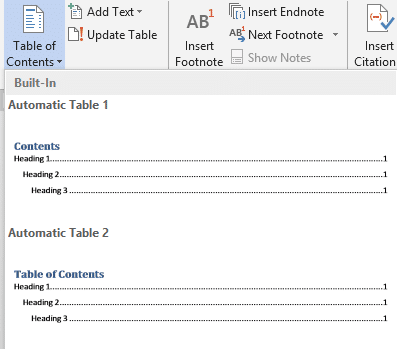 Now that word knows your topics and it anyway knows the page numbers, it can put these together and create a TOC automatically. By default three levels of headings are added to the TOC along with page numbers. You can change the settings from the Custom Table of Contents option. 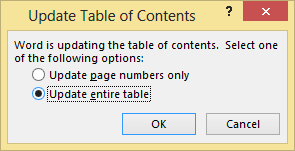 Remember to update the table before printing because the page numbers are not automatically updated when you edit the document. Right click on the TOC and choose Update Field or click inside the TOC and choose Update Table option. 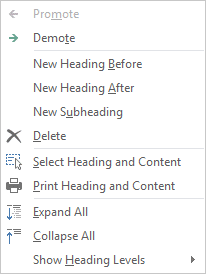 For very large and complex documents you can choose the first option (which is faster) when you are sure that you have not added any new headings. In most cases using the second option is safer. You will love Styles once you start using them. But then you will feel very sad that your older documents are not getting all these benefits of styles. But don’t lose heart. Microsoft has thought of that as well. 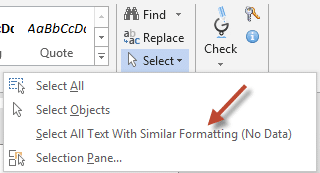 Open a document which is using manual formatting. 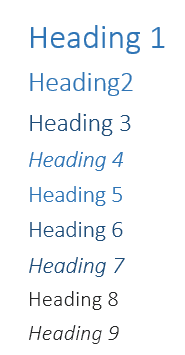 You need to find all areas where manual formatting indicates various levels of headings and then apply the correct Heading Style. But this is going to be very time consuming if you want to do it one by one. Repetition means inefficiency. Don’t worry if it shows (No Data). It works anyway. Styles have many more benefits. One very useful feature is the ability to convert a Word document to a presentation. I will cover that in the next article.